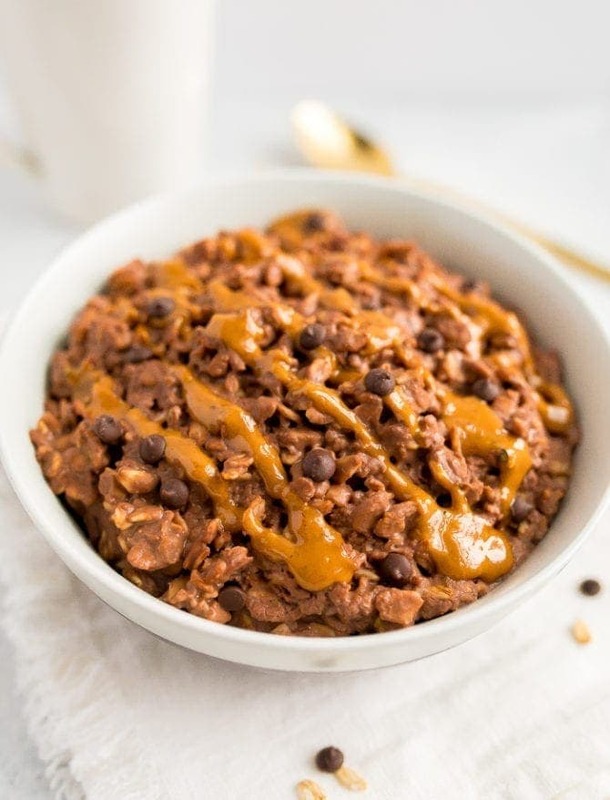 A 3 minute chocolate peanut butter oatmeal recipe that uses old-fashioned oats. Just pop in the microwave and enjoy! Gluten-free, vegan and high protein. Do you ever have those hectic mornings where you are rushing around, trying to leave on time, trying not to forget anything AND trying to make sure you don’t forget to eat breakfast? Of course you do, because you’re human. This recipe is for you on those busy mornings. It’s also for those of you working in the corporate world or living the dorm room life (aka only have access to a microwave). I know for a fact that it is possible to eat healthy with limited resources . . . I started my health journey in college by incorporating healthy habits and starting an exercising routine. And many of those habits I started back then are still a part of my daily routine today. Now THAT I am proud of! One of my top pieces of advice when it comes to healthy habits is to start small. Start with one doable change and slowly build. A great one to start with? A healthy breakfast with a good mix of carbohydrates, protein and healthy fat. 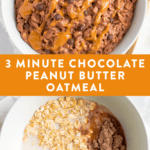 Don’t feel like it needs to be a three-course meal – something as simple as this 3 minute oatmeal is perfect and makes it easy to fit all three macronutrients into one bowl. 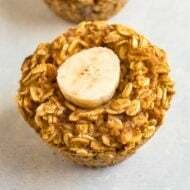 If you think oats aren’t that filling or they don’t keep you satisfied for long, I’m here to prove you wrong with this recipe! Instead of using water, we’re using almond milk as the base to make it extra creamy and satisfying, as well as, mixing in protein powder and peanut butter. 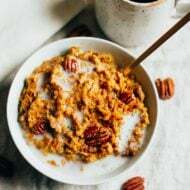 These add-ins will increase the protein and the fat, two key components to help make oats a full meal that will keep you going all morning long. 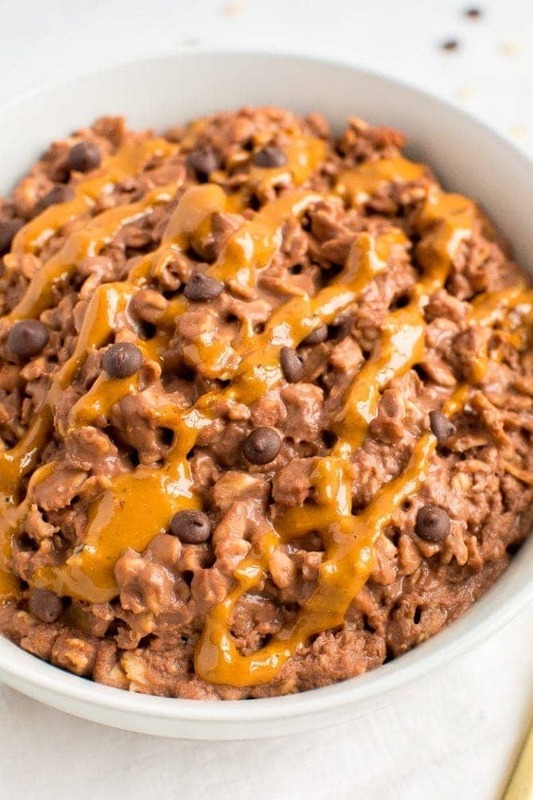 The best part about this recipe is most definitely the peanut butter and chocolate flavor combo. Can we all just agree that peanut butter and chocolate is legit one of the best flavor combos on earth? If you don’t agree, I’m not sure if we can be friends. 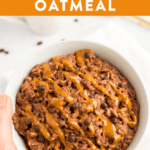 😉 Seriously though, if you like peanut butter and chocolate you will LOVE this oatmeal… the flavor reminds me of my healthy no bake cookies, but in breakfast form. I’m a stovetop oats girl through and through, but I get that using the microwave is super convenient, some people don’t have time to cook stovetop oats and some people just don’t want to wash another pot in the AM. I get it – and that’s why I’m sharing this microwavable oatmeal recipe. For microwaving oatmeal, I highly recommend splitting up the time into increments and watching it like a hawk so that your oats don’t boil over and make a huge mess. It’s happened to the best of us – I usually microwave for 1 minute, stir and then microwave in 30-second increments until I’m happy with the consistency. It usually takes about 3 minutes of cooking time, but it will depend on your microwave. The oats are done when most of the liquid is absorbed! 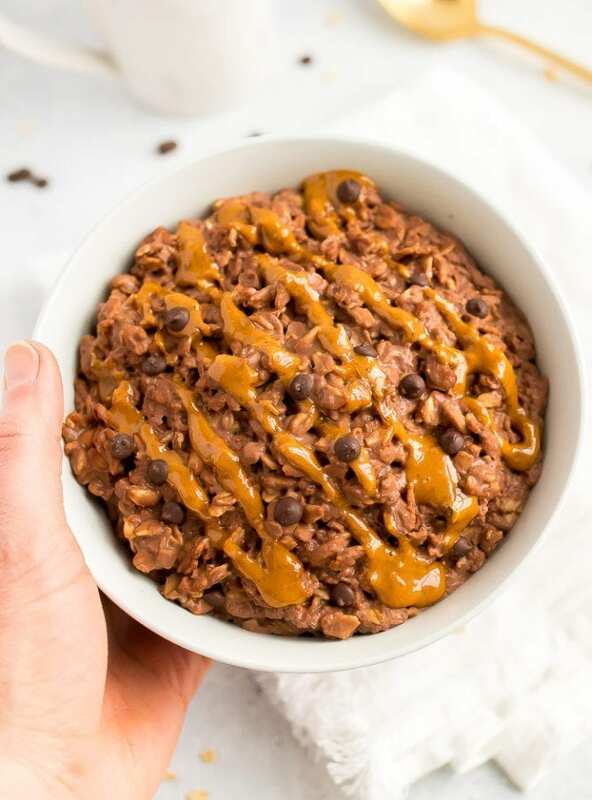 For this chocolate peanut butter protein oatmeal, once the oats are cooked you stir in your chocolate protein powder until it’s completely dissolved . . . then top with peanut butter and chocolate chips! Bam – you’re ready to go with a delicious, healthy, protein-packed breakfast! 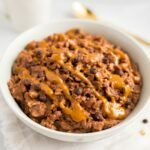 If you try this peanut butter oatmeal be sure to leave a comment and star rating below letting me know how it turned out. Your feedback is super helpful for the EBF team and other EBF readers who are thinking about making the recipe. Add oats and almond milk into a bowl and stir to combine. Microwave for 1 minute, then stir and continue to microwave in 30 second increments, stirring between each, until the oatmeal is the consistency you like. I usually cook for a total of 3 minutes, but you’ll know it’s done when most the liquid is absorbed and oats are hot. Carefully remove from microwave (bowl will be hot). 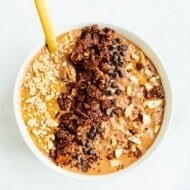 Stir protein powder into oats until completely dissolved and top with peanut butter and chocolate chips, if using. To cook this recipe on the stovetop, you’ll need 1/2 cup oats and 1 cup of almond milk. Heat over medium-high heat for 7-10 minutes, stirring frequently to prevent the oats from sticking. You’ll know it’s done when most of the liquid has been absorbed and the oats are creamy. Remove from heat, stir in protein powder and transfer to a bowl. Top with peanut butter and chocolate chips, if using. Just made this and it’s delicious! I love making it in the overnight oats way, but sometimes I forget to do it the night before so this method was perfect! Amazing, I’m so pumped that you liked this method, Erin. Quick favor, would you mind leaving another comment with a star rating for the recipe? It’s super helpful for SEO for EBF. 🙂 Thank you! !